It has reached the point where the Inside Passage between Vancouver and Juneau has become a veritable superhighway for summertime cruise ships. 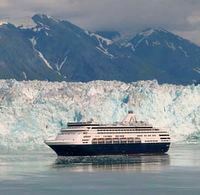 Everyone and their mother are yearning to see the glaciers and wildlife of Alaska and there is no better way to do it then aboard a cruise ship. Like any other form of travel, the longer you wait to book your cruise the more likely it is you’ll have to pay more later than you would now. There are exceptions, of course. The cruise industry is famous for its last minute deals. Why risk getting shut out though when you can take care of business now and book yourself a nifty cruise from Vancouver to Hubbard Glacier? The 7-night cruise travels along the well trodden Inside Passage with stops in Juneau, Skagway and Ketchikan, in addition to spending a couple of hours at the Hubbard Glacier. All in all it is a winner.